"The Greeks are the rightful owner"
Dr Christos Tsirogiannis has been interviewed by The Times over the marble lekythos and the marble loutrophoros that were being offered for sale in London by Jean-David Cahn (Jack Malvern, "Expert attacks sale of 'stolen' Greek vases", The Times 24 October 2017). On the left (no. 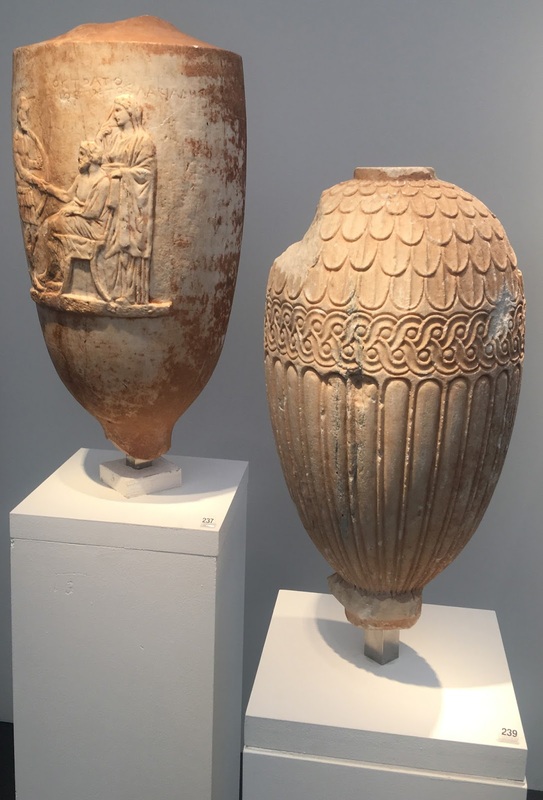 237), the history of the lekythos is given as "Formerly Swiss art market, October 1977". I understand from Dr Tsirogiannis that the lekythos was listed by Gianfranco Becchina on 5 September 1977. Was this information known to Cahn? The lekythos is listed as co-owned by Becchina and George Ortiz. On the right (no. 239), the history of the loutrophoros is given as "Formerly Swiss art market, October 1977". These two funerary markers are almost certainly from a cemetery in Attica, and Tsirogiannis is right to suggest that "the Greeks are the rightful owner", especially if there is no documentation relating to their movement from Greece to Switzerland. More troubling is the role of the Art Loss Register. If the ALR was not able to identify the markers in a photographic database, they needed to say that very clearly. But perhaps they did. But Malvern tells us, "The Art Loss Register said that it was considering its position on the vases." Why does the ALR need to reconsider? Does it think that it gave misleading advice? Does the ALR need to reconsider all its advice relating to recently surfaced antiquities? We presume that Cahn has now had time to contact the Greek authorities to arrange their return. What does "mint provenance" mean?